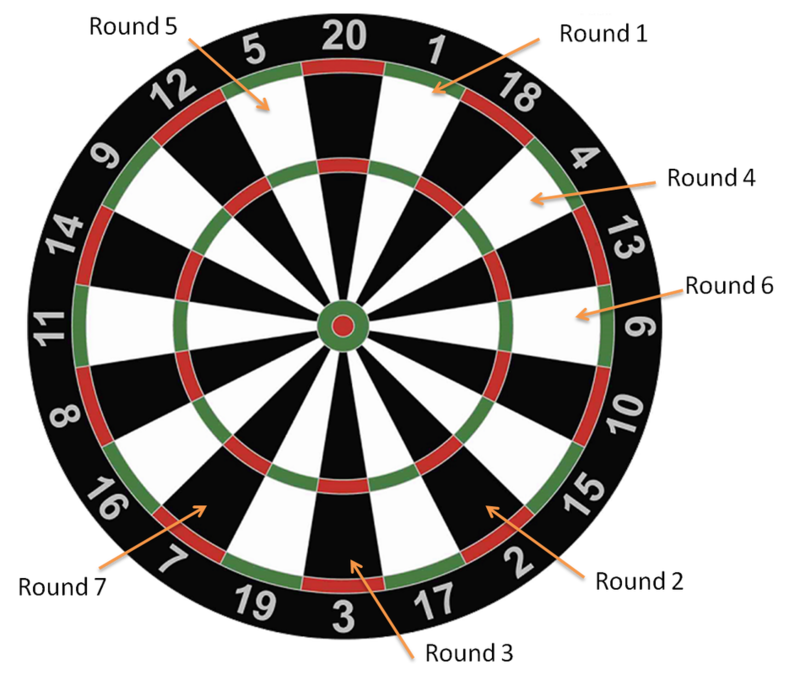 This game is a fun way to test your accuracy in various locations around the dartboard. You work your way progressively at target areas 1-7 with each round counting for more and more points. The first turn starts off by targeting anywhere within the 1 on the dartboard and increments to 2 in the second round, then 3 and so on until 7. It can be played by individuals or teams of rotating players for each turn. This game starts off by determining which player or team will go first. There is no advantage to going first in Shanghai so a simple coin flip is recommended. Take turns throwing 3 darts per turn starting with the target of 1 on the board. The number of points you earn for each hit is dependent upon what the round number/target area is. If you land 3 darts in 1 on the first round, you score 3 points. If you land 3 darts on the 2 target area in the second round, you score 6 points. This makes it easy to catch up in later rounds if you fall behind. When you work your way up to round 7, the highest score could be a 21 if you land all 3 darts in the target area. There are actually two ways to win Shanghai with the obvious winner having the most points at the end of the 7th round. However, there is a slight twist to Shanghai that allows you to hit a single, double and a triple with your 3 darts in a single round for the number that is currently in play. Shanghai could end in the first round if a player is able to do this on their first turn.